I like to think of fancy candles as pieces of art that just so happen to imbue my home with a delicious scent. A beautifully crafted, high-luxury flame immediately turns my tiny abode in the suburbs of New Jersey into Buckingham Palace. Many brands come to mind when I think of a luxe candle, but only one reigns supreme: Fornasetti Profumi. Their artfully crafted, handmade ceramic jars have always been major eye candy to me, and the latest spring offering is no exception. I spoke with Laurent Delafon, co-founder of United Perfumes (the company that creates and distributes Fornasetti Profumi), to give me the scoop on Giardino Segreto, the dreamy new owl-adorned range for spring. Every Fornasetti scent has its own olfactive story. The entire collection revolves around the Fornasetti family home in Milan. 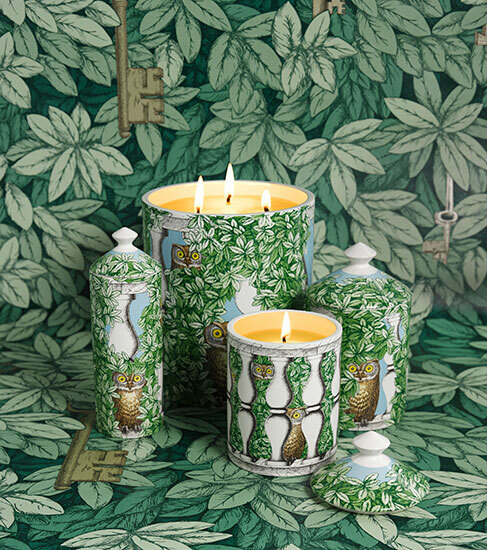 For example, the brand’s signature scent, Otto, represents the inside of the home, while the Flora di Fornasetti captures the essence of the gardens outside. But the brand opted to create an imaginary landscape with the spring scent, using their signature owl design. As for the scent, Giardino Segreto evokes an aroma that fits with the stone balustrade covered in greenery design. Giardino Segreto is available in a 10.5 ounce scented candle, room spray and the large, 65 ounce scented candle which I learned serves multiple purposes once the candle burns out. Delfono’s clients in Europe are all about recycling the ceramic canisters for different household purposes. “I’ve got a client in Paris who has one on her table when she serves shellfish. She uses it for what we call 'poubelle de table' (a.k.a. a table-top bin) in French, which is to get rid of the shells,” he says. “We have clients that keep them in bathrooms and living rooms. You can store your makeup brushes, tweezers, cotton buds, cotton balls, cotton pads, Q-tips." I’ll be sure to remember these artsy canisters the next time I’m re-organizing my beauty products. Delfono gave some awesome ideaa, no? Get all your Fornasetti goods at Aedes de Venustas now.